When shopping for windows, some of the materials and terminology can be a little confusing. For example: what’s the difference between a vinyl window and a wood window with vinyl cladding? Is one better than other? What about cost? We’ll answer a few of those questions here. The first thing to understand is exactly what window cladding is. A window clad is basically the exterior dressing of the window. For example, a vinyl clad window could be made of wood, but the exterior is covered by vinyl to protect the wood. The most common types of cladding are aluminum and vinyl, and the usual reason is to protect the window from the elements. Generally, a wooden window looks amazing but will require a lot of maintenance. Wooden windows need to be painted or stained in regular intervals to keep it protected. To cut down on maintenance, a wooden window can have an aluminum or vinyl cladding to protect the exterior from the elements, while allowing you to enjoy the beauty of a wooden window from inside. In terms of cost, you’ll quite often find wood at the higher end of the scale. With wood windows, you definitely don’t want to go for the cheapest ones you find. Quality wood windows -especially ones with a quality cladding- are going to cost more, but they’ll also look great and last a long time. Vinyl will be the least expensive option, and it’s also one of the most popular due to the lower maintenance and solid durability. 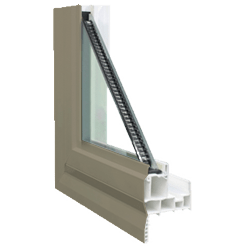 Vinyl windows not only cost less but they perform exceptionally well when it comes to insulation values and are some of the most common windows you’ll find in Canada today. Aluminum tends to be slightly more expensive than vinyl, but slightly less than wood. Although aluminum is a very strong material that is extremely durable, it also conducts heat and cold, which can make them less efficient than vinyl or wood. Quality aluminum windows should feature thermal breaks help stop the conductivity. Wood and vinyl windows tend to be the most popular. Wood windows are often chosen for their looks and easy access to building materials. Many homeowners prefer the look of wood to vinyl or aluminum. Wood also performs efficiently in all climates. As mentioned earlier, wood windows are going to require regular maintenance in order to have a long life; however, wood is susceptible to rot, so any leaks can be fatal. Vinyl and aluminum windows are chosen when price is a concern, or low maintenance is desired. Besides the occasionally cleaning and caulking, you’ll probably never have to worry about vinyl as it is extremely low maintenance. Previously, the main downside to vinyl was that you can’t paint or stain it, but at Euroclad we can colour coat vinyl windows, so that’s not a concern anymore. Aluminum offers a similar durability to vinyl but may require you to paint it if you live in a harsh climate. Although it’s durable, you won’t see much aluminum on the coast due to the salt corrosion. Aluminum is slightly less efficient than wood or vinyl, which can mean it will be cold to the touch and sometimes have condensation. No matter what material you’re thinking about using in your home, drop by our showroom to see the various material and cladding options available to you, and we’ll find one that will work with style, budget, and maintenance needs!